Returns the sum of each column in an Excel range as an array (CSE) formula. Links source data to target result, with returns values processed by a custom function, rather than writing formulas directly to the target worksheet range. Each column in the range, InData is processed in a series of subarrays. Non numeric data returns a #VALUE error. 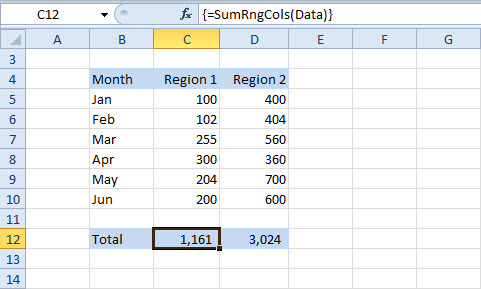 In Excel, the SumRngCols function is entered as an array (CSE) formula. The return value array (1 row x 2 columns) is in the range (C12:D12) in the worksheet (figure 1).